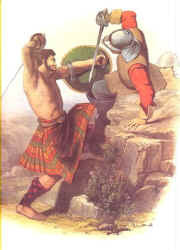 The typical Scottish targe date from 16th.century (although there’s an act of the Scottish Parliament from mid 15th.c which does mention of the ‘round leather target’ ‘eythir of ledder or of a firme borde wi twa bands on the bak’) until the Battle of Culloden in 1746, the Scottish Highlander’s main means of defence in battle was his targe. After the disastrous defeat of the Jacobites at Culloden, the carrying of the targe would have been banned, sand many would have been destroyed, or put to other uses. Those which do remain appear to be of quite intricate patterns, and are well decorated, indicating that they would have originally belonged to important people. Targes are round shields between 18″ and 21″ (45–55 cm) in diameter. The inside of the targe was formed from two very thin layers of flat wooden boards, with the grain of each layer at right angles to the other. They were fixed together with small wooden pegs, forming plywood. The front was covered with a tough cowhide which was often decorated with embossed celtic style patterns. This was fixed to the wood with many brass, or in some cases, silver, nails, and occasionally brass plates were also fixed to the face for strength and decoration. Some targes had center bosses of brass, and a few of these could accept a long steel spike which screwed into a small “puddle” of lead which was fixed to the wood, under the boss. When not in use, the spike could be unscrewed and placed in a sheath on the back of the targe. In the picture (right) is a targe from the Tower of London it shows how the targe was constructed. Most targes had their back covered with cow and goat with Just 15 % of the average ones having had deer skin and most of them date from post Jacobite era and a great percentage are just fakes from Victorian times. As for back padding, 80% of original targes still show straw, crude wool and other stuffing material beneath their ruined skins. Some targes, usually those actually used in battle, had their backs covered in a piece of red cloth taken from the uniform of a government soldier (a “Redcoat”) that the owner had killed in battle. Although all the old targes show signs of handles and arm straps, of various designs, there is very little evidence to indicate that there was any guige strap for carrying the targe over the shoulder. The face of a targe typically used two general patterns – concentric circles, or a centre boss with subsidiary bosses around this. 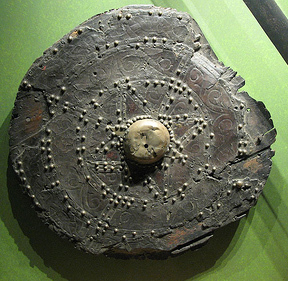 There are a few notable exceptions, such as a targe in Perth Museum in Scotland which is of a star design. 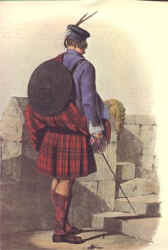 Although some targe designs appear to have been more popular than others, there is very little to indicate that there ever were “clan” designs. The nearest that one might come to finding a “clan” design is possibly the four identical targes which came from the family armoury at Castle Grant. It appears more likely that targe designs were individual to their owner. During the 1745/46 Jacobite uprising, a William Lindsay, a shieldwright in Perth made hundreds of targes for Charles Edward Stuart’s army. He made a distinction in price between an “officer’s targe” and an ordinary targe.